In a perfect world, great changemaking ventures would grow purely based on their own merit. In the real world, we have to be creative and strategic about how we brand our initiatives and get the support we need to help them grow into effective, sustainable organisations. Creating a strong brand is crucial to increasing your impact and getting the audience you deserve. With over twelve years of experience as a brand developer, Anne Miltenburg has worked with organisations and people as diverse as tech companies, artisans, womens rights activists and bankers, from Zambia to Tunisia and from the USA to Saudi Arabia. To help her clients and workshop participants think like brand strategists, Anne developed tools and exercises to make the branding process easy to comprehend and apply. 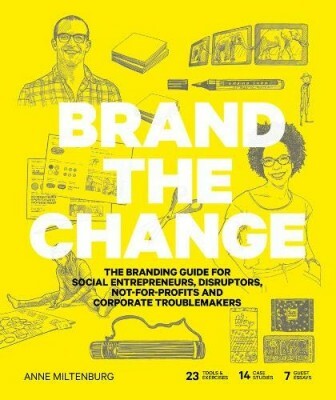 This toolkit opens up her methods for everyone looking to build or strengthen their brand for change: social entrepreneurs, activists, NGOs, creatives and disruptive businesses. This entry was posted in Buch and tagged Brand, Buch, Lifestyle, Marke by michael. Bookmark the permalink.